I took this photo 30 yards from the kennel fence when I was starting out for a walk. I was standing at the edge of the 600 acres owned by a timber company that border one side of my property.There were two deer grazing in the clear cut, one moved on before I took this shot. You can see how steep the ravine is from the trajectory of the electric lines. 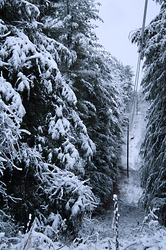 The photo shows why electric power to my home is rather easily lost in heavy snow, ice, or wind conditions. 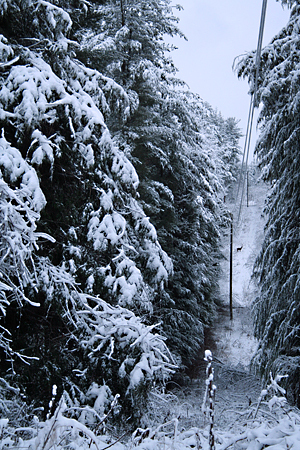 The trees battle the power lines and the lines go down in defeat. Most years, February gives us our most severe winter weather. This was certainly the case for 2010! Interestingly, in the first two weeks of this month, southern Ohio had more snowfall, 21 inches, then Fairbanks, Alaska which had 20 inches.